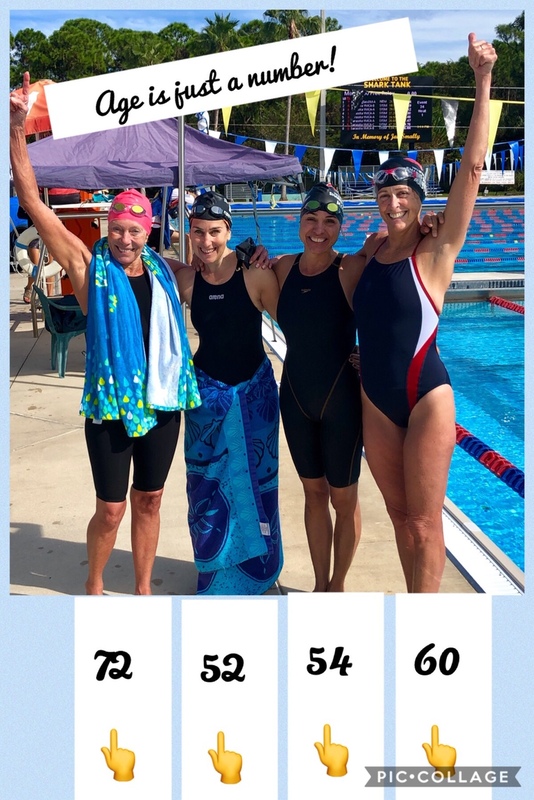 SARASOTA, FL — YNS Sharks Andi Freedman, Beth Lott, and Lisa Zraket celebrated their birthday weekend by swimming in the Sarasota YMCA Masters’ Shark Tank SCM Meet in sunny Sarasota, FL on Nov 3-4, 2018. As an extra gift, Diann Uustal (NEM-SWMR), also competing at the meet, was able to join the NEM-YNS ladies to form a New England Masters Swim Club (NEM) relay team. The foursome swam the 200-meter freestyle relay together and walked away with a first place finish! Lott spent her 60th birthday participating in her first ever swim meet, diving headfirst into her 60s while crushing distance and sprint events. Freedman grabbed a first place finish in her signature backstroke event — and was asked to be a model for Swimmer Magazine! — while maintaining an impressively positive attitude in the face of mishaps (pulled muscle, foot bruised on a turn, and a DQ). Zraket decided to cram 5 events into each day and tackle her worst fears: trying the 50 butterfly and the 200 IM. Uustal was the strong, determined, unofficial coach giving positive feedback and support throughout the meet. The Sarasota Sharks were very welcoming and friendly. It was an amazing and fun meet filled with a group of Master swimmers coming together, regardless of age, skill, and motivation, to share their passion for swimming and competition.